The city is located in central Ubud Bali and 30 km south-east of Denpasar, the capital. 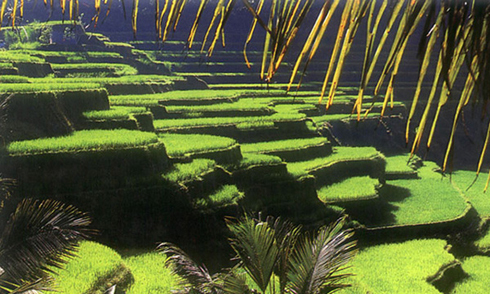 Ubud is surrounded by tropical rain forests and beautiful rice terraces. Many of the former palaces have been converted into hotels and thus convey a feeling of old Bali `s The town of Ubud in Bali is mainly known for its artists produce carvings and paintings. The change of Ubud for comparison of previous years is enormous. Cafés, restaurants, shops and nice places were created in no time and give a modern impression. The various street vendors and shops of paintings truly invites you to stroll through the streets. Ubud should be your last tour stop, come here easily by minibus to the airport in Denpasar. In the center of Pari Saren you find a very old building. This palace was the former residence of the Raja of UDUD. Of particular note here is the mask and the Holy delch the monkey general. A part of the palace is used as a hotel. Puri Lunkisan is also called the Palace of the painting. In the center of Ubud in a park, see Exhibit 3 Building the beautiful art of Balinese artists. The opening times are daily from 8.00 to 16.00 clock.